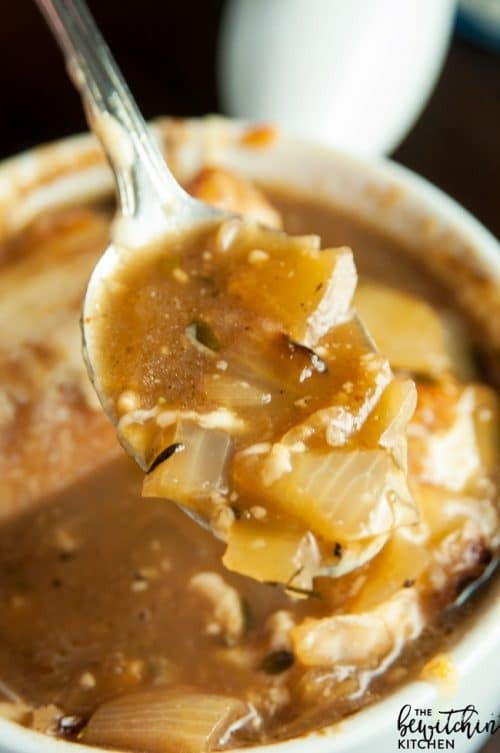 This Irish Onion Soup recipe is a rich, yet smooth soup that’s perfect for fall or winter. It warms your bones after a day out in the cold. Onion Soup French or Irish? 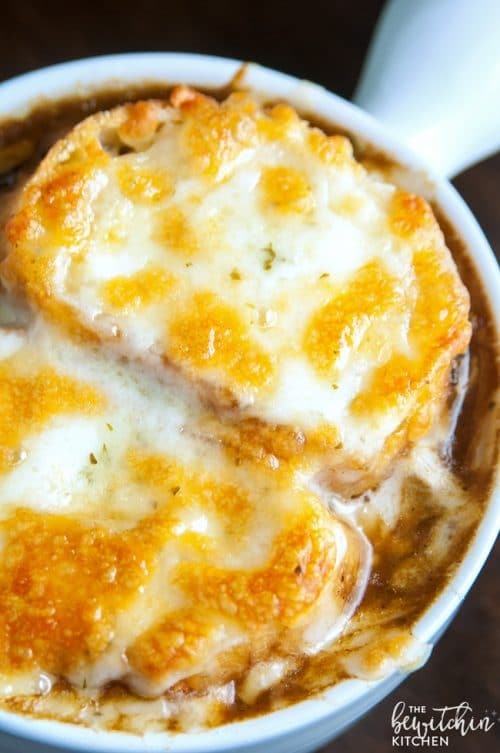 I love a good french onion soup, I’ve tried so many different recipes but one of my favorites uses red wine. Today I played around with the ingredients and added whiskey – and Irish Onion Soup was born. It’s only October and I’m already sick of winter. We had an early snowfall (which has since melted) and I was over it before it even really began. The day I made this soup I was watching the snowfall, it’s a hard reality to face when the week before I was parasailing and hanging out in the Florida Keys. Oh, how I miss the warm weather. The oddest thing happened when I went to the grocery store, they were out of regular yellow onions. I couldn’t find them anywhere! So I bought a bag of the smaller variety and used about 9. I measured it to be eight cups. These mean little guys burnt my eyes bad. 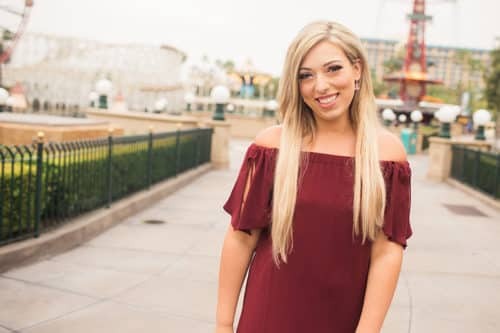 Thank goodness for eyelash extensions and the no longer need of mascara! 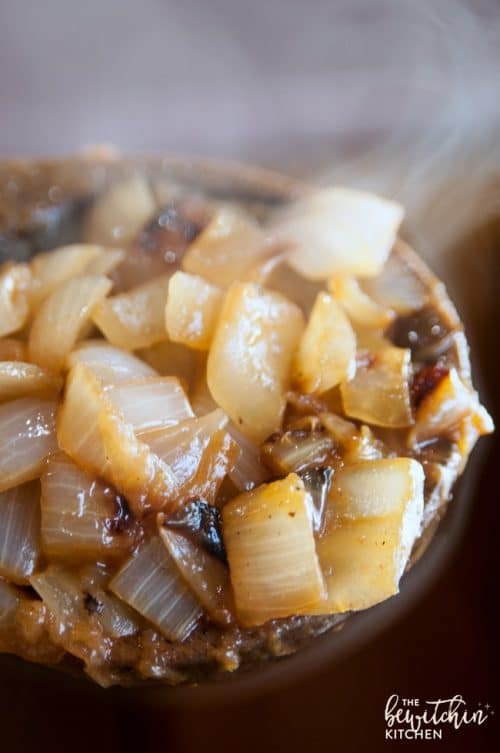 One of the best part of french onion/Irish onion soup? 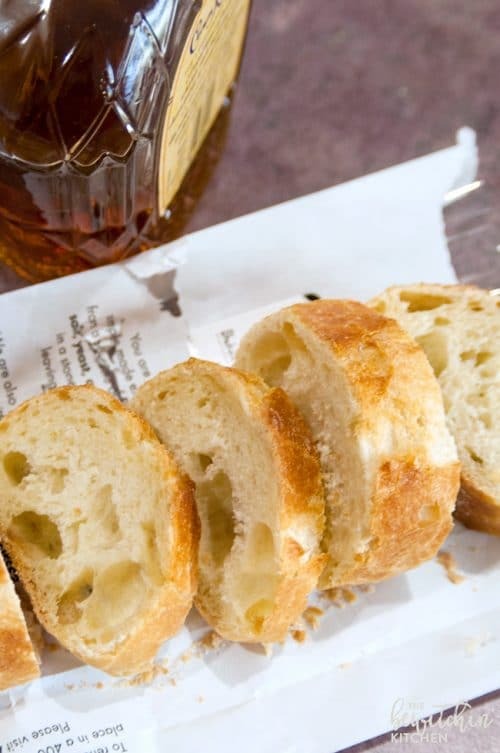 The french baguette to soak up all the juice. Randa’s Tip: Let the baguette sit out overnight so it crusts up. Another recipe tip: keep an eye on your onions as they brown. 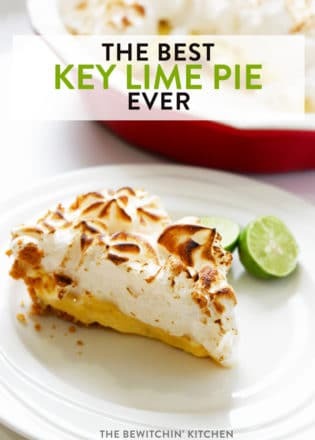 If you leave it for over five minutes, they will start to burn and the bits are hard to scrape off the bottom. They should look a little darker than the above photo. It takes about 30-40 minutes. This picture was taken at about the 20 minute mark. 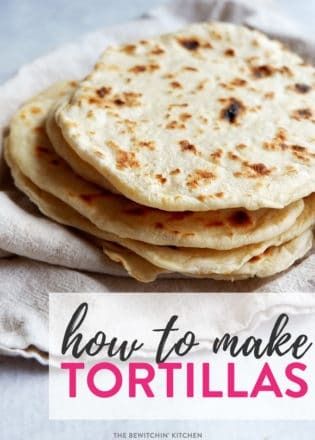 By the way, at this point, your home will smell amazing. The same goes for cheese. The more cheese, the better. I used the creamy herb and garlic mozzarella but regular mozzarella is just fine. Helpful time: don’t walk away when you’re baking the onion soup – that’s when it burns. 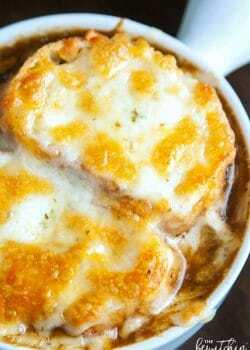 Irish Onion Soup – it’s french onion soup with a whiskey twist. A delicious soup recipe that’s perfect for fall and winter. 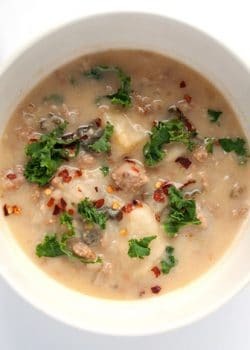 Below are some of my favorite soup recipes found here on The Bewitchin’ Kitchen. Instant Pot Chicken Tortilla Soup (easy to convert to the slow cooker or stove top). 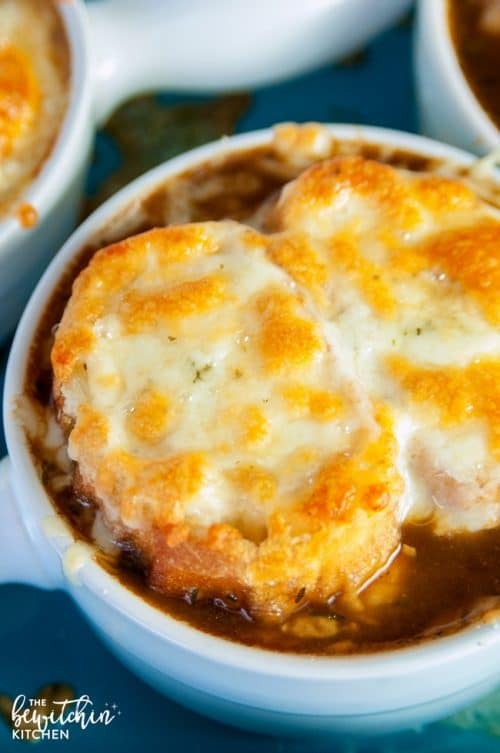 A whiskey twist makes this French Onion Soup inspired recipe Irish! In a large pot, over medium-high heat (if you want specifics I cooked on a 6-7) add the butter and onions, stir. Brown the onions for 30-40 minutes, stirring often. If you find that the onions are sticking too much to the bottom, add more butter or a splash or two of the beef broth. Add the garlic and flour and stir for roughly a minute. Now the fun part, add the whiskey and scrape the bottom of the pan. Get all the bits and simmer the alcohol down for 8-10 minutes, over medium height. Next add the beef broth, bay leaves, thyme, Worcestershire sauce, sea salt, and pepper. Taste and if it's not rich add a heaping spoonful of beef bouillon (I used Better Than Boullion - get it at Costco or Amazon). Simmer over medium heat for 35 minutes. 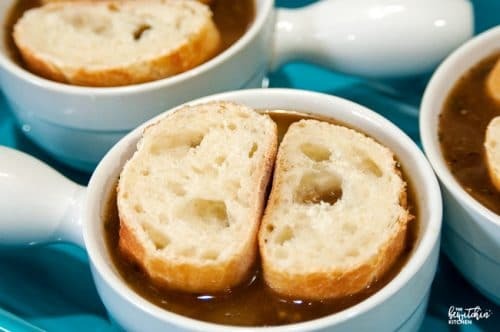 Ladle the soup into french onion bowls, and top with the slices of the baguette. Layer on the cheese and bake for 5-10 minutes. 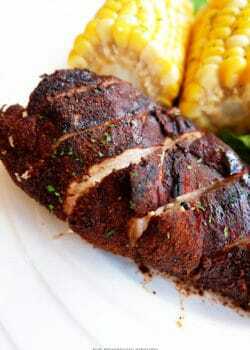 Keep an eye on it so it doesn't burn, just until the cheese gets golden and bubbly. 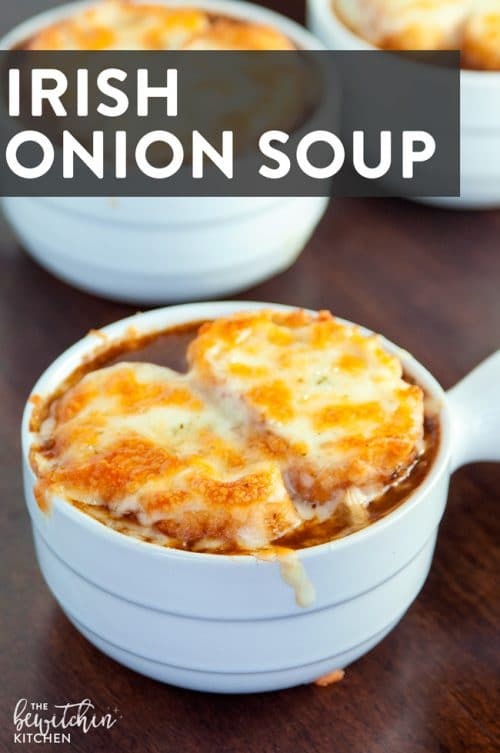 The Irish onion soup looks so delicious and I have not made onion soup before. 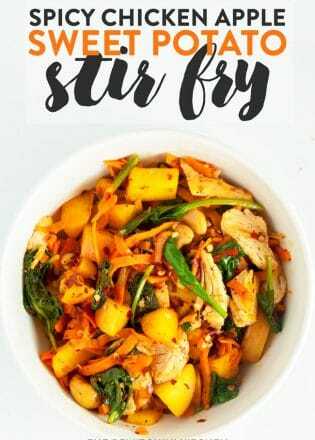 I want to make this because it is cold outside and this soup will warm me up. Thanks for sharing such an awesome soup! I have an allergy to onions but this soup looks so good I might risk the reaction. Any certain kind of whiskey? Onion soup is my favorite, just never tried it with whiskey. I have Jameson, so hopefully that works! 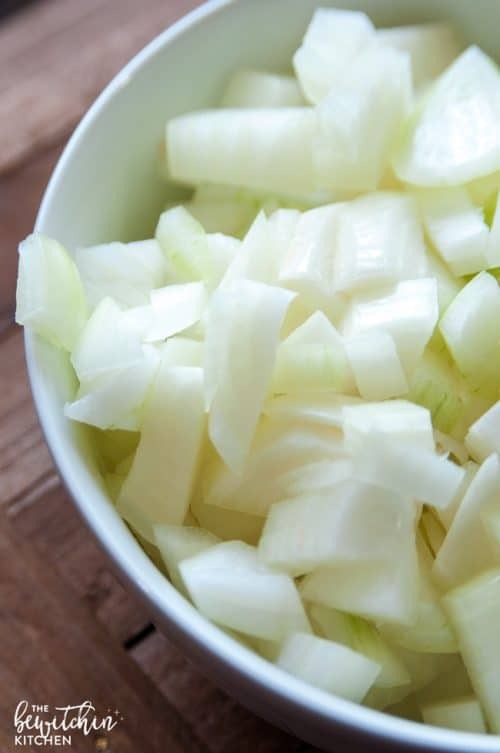 If you use 3-4 different types of onions, it will give it a whole other depth of flavor. 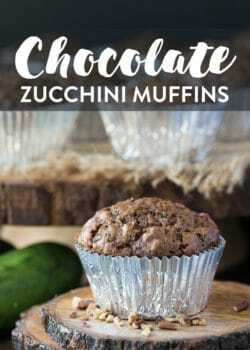 Also, adding a little pinch of nutmeg (between 1/8 to 1/4 teaspoon, depending on the size of your batch of soup) will accentuate the flavors, without adding the taste of nutmeg!